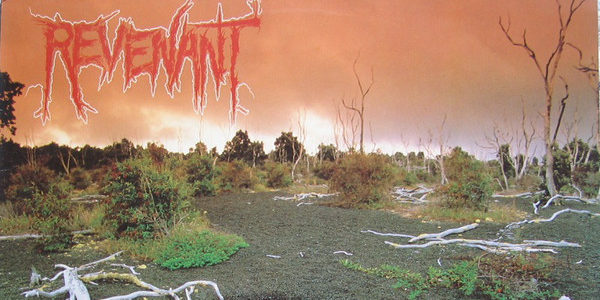 Part’s 1 & 2 of our under-appreciated classics of American death metal highlighted the likes of Oppressor, Infester, Morta Skuld, Ripping Corpse and Rottrevore (among others) but there’s plenty more quality death from the good ol’ U.S of A still knocking around, often found collecting dust at the bottom of the death pile! Instead, Part 3 attempts to draw attention to those albums which often find themselves cast aside in favour of the big guns of death metal and serves as a mere introduction to the sheer quality of death metal which boiled away in the underground of the late 80’s to early/mid 90’s! A death/thrash colossus, Revenant‘s one and only full length remains a fast and frantic, technically audacious slab of semi-forgotten brilliance! These New Jersey boys were a class act and they somehow managed to conjure an album that perfectly encapsulated the forward-thinking nature of early-90’s metal, while – at this stage – also giving Chuck Schuldiner a run for his money in the ‘progressive’ stakes. Like a (much) heavier Aftermath, Revenant would stop and start on a dime, toying with pace and tempo at will and embracing crushing doom passages when they weren’t slashing and thrashing their way through hyper-speed death metal. Precious few bands could match such a dark, multi-layered, multi-faceted work of ever-changing tempo and arrangement, making Prophecies Of A Dying World an absolute meisterwerk; under-appreciated or otherwise!